The Cimbria Unitest 5G is a newly developed state-of-the-art temperature measurement system. It is a fully-automatic system for the monitoring of temperature in grain and other crops or woodchips. The system can be used in all types of grain storage facilities and can be installed in both new and existing installations. The temperature is constantly monitored by means of a number of sensors which are fitted in carrying cables specially designed for the installation in question. Unitest 5G software ensures great user-friendliness, it can easily be adapted to all languages, and with the help of icons Cimbria has simplified the use of the system to ensure global user understanding. Unitest 5G software is available with multi-access level, whereby the use of passwords provides protection against unauthorized use. 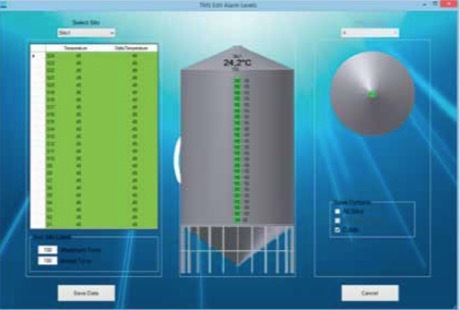 Automatic ventilation of silos is important when heat is generated, but it is also of great importance that this takes place at the right time and at the right outdoor temperature. Unitest 5G has been developed with focus on this aspect, such that unnecessary ventilation is avoided. This ensures that savings are achieved in terms of electricity consumption. Unitest 5G is not just a temperature measurement system; it can also be used to measure product level and thus calculate volume. The software update also enables better access to statistics, hard copies/extracts from the database, the option of email reporting, as well as easy implementation with existing systems, e.g.SCADA. Globally, the Unitest system has been installed on more than 6,000 plants, which means that Cimbria occupies a position amongst the absolute leaders in the field. During the development of Unitest 5G it has been essential not only to look forward, but also to cast a glance backwards to ensure that our existing customers are taken into account, and that they are also able to have the new software implemented without necessarily having to replace existing hardware.